Using a food thermometer is the best way to check for doneness but with most cuts of bacon, this method won't work. Getting it right when it comes to cooking time is important, however, to kill bacteria present on the meat. In most cases, a visual inspection is the only way to check if bacon is cooked. If your bacon is at least 1/2 inch thick, however, you can use a fork style food thermometer as a way to check bacon for doneness. Arrange bacon slices in a single layer on a rack in a shallow baking dish or on a broiler pan using tongs to arrange the slices. 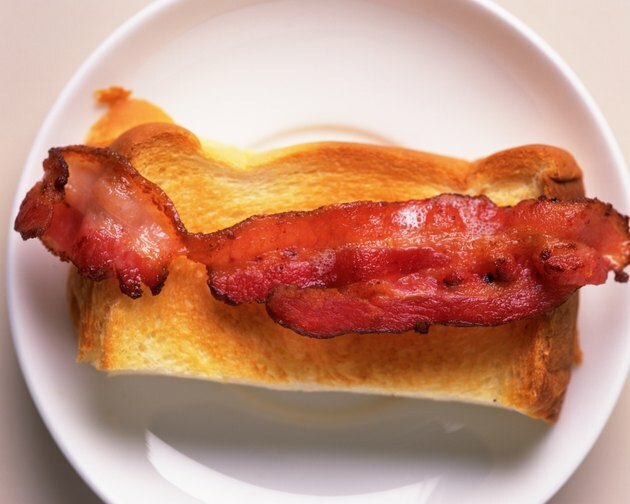 Bake regular cut bacon for a minimum of 12 minutes, thick-cut bacon for a minimum of 16 minutes and extra thick, or butcher's cut bacon, for a minimum of 19 minutes. Inspect the bacon to make sure it is a dark brown color. Cook any thickness for up to five additional minutes if you prefer crispier bacon. Add bacon slices in a single layer to a cold skillet using tongs. Turn a burner to medium heat and cook the bacon slices, turning each slice with your tongs about every minute. Cook the slices for about eight to 10 minutes depending on thickness or until they reach a uniform dark brown color and have the degree of crispiness you prefer. Transfer the bacon slices to paper towels, let them drain for 30 to 60 seconds and transfer to a serving platter. Heat olive oil in a skillet on your stovetop over medium heat. Cut slices from a Canadian bacon roll to a thickness you prefer using a sharp kitchen knife or use precut Canadian bacon slices. Add the bacon slices to the hot skillet using tongs. Cook the bacon for two minutes, then turn with tongs and cook an additional two minutes. Inspect the bacon to make sure it is brown and slightly crispy. Insert a fork style food thermometer 1/4 inch into bacon slices more than 1/2 inch thick and make sure the temperature is 160 F before transferring the bacon to paper towels to drain before serving.